South and North Korea discussed cooperation in combating forest diseases and modernizing tree nurseries in the North when a group of South Korean officials visited Pyongyang earlier this week, the unification ministry said Friday. The meeting was held between Lim Sang-seop, a senior official of the Korea Forestry Service, and his North Korean counterpart, Jang Yong-chol, according to the ministry. Lim headed a 10-member South Korean delegation to the North for a three-day trip from Tuesday. "During the working-level talks, they shared views on joint efforts to fight tree diseases and pests, and implementation of inter-Korean agreements, including modernizing of tree nurseries (in the North)," the ministry said. The ministry said that detailed cooperation measures will be drawn up based on the outcome of the talks in close coordination with relevant government agencies and expert groups. 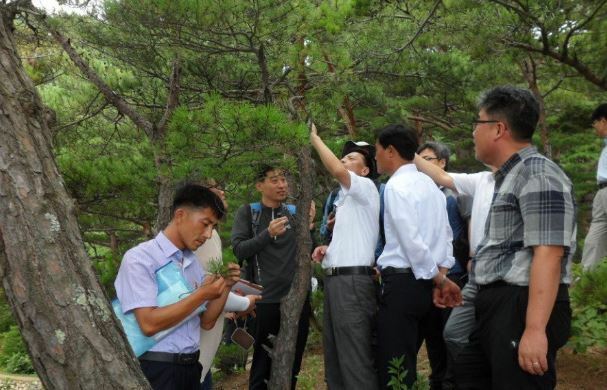 During the trip, the South Koreans also toured tree nurseries in the North, including one in Pyongyang, and visited a Pyongyang plant that produces tree-related equipment, it added. The trip was to follow up on an agreement made in October to jointly combat pine tree pests and other forestry diseases until March next year. The two also agreed to push for the modernization of 10 tree nursery plants in North Korea this year, while promising to work together in combating forest fires and protecting ecosystems.